A contemporary look for a traditional Nantucket shopping basket! My personally hand-crafted Market Carrier Nantucket Basket features traditional craftmanship and a contemporary cherry wood stationary handle inserted into the basket down into the inside! Featuring a wide cherry wood base which has been routed along the inside and outside edges for a nice detailed look. Traditional hand-tapered and beveled cane staves with tight, fine-grade cane weaving. 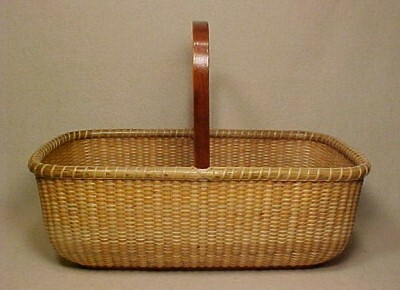 The rims for this Market Carrier Nantucket Basket are dyed rattan reed, nailed and single lashed. The stationary cherry wood handle has been hand-carved, steam-bent and formed to a mold for a perfect fit to this sturdy basket. The tips of the handles are inserted into the weaving near the base of the basket, and have a carved lip under the inside rim for additional strength. Nailed thru the rims for the absolute best stability. The Market Carrier Nantucket Basket measures 13.25" long x 7.75" wide, 4.5" high to the rims and 9.5" high to the top of the stationary handle. Although I am no longer accepting orders for the Nantucket Basket Market Carrier, I may craft one or two of these per year. When its ready for sale, you can purchase it directly from my Simply Baskets website.